1. Jimmy Owl Cushion £17.00 [x] : If you don't have a bit of love in your heart for one of these vintage looking owl cushions then you must have a heart of stone. SO cute. 2. Grey Owl Glass Vase £25.00 [x] : I'm starting to lose track of how many animal vases I have posted on this blog, which is proof that I am a little too obsessed. I love this one because the shape is so unique, it does look a little hopeless for actually holding flowers though so it may just have to be ornamental. 3. Turquoise Folk Owl Mug £8.00 [x] : I don't think I even need to explain why you need this in your life. Sign me up for one right now, total mug goals. 4. Owl Contact Lens Case £4.00 [x] : As someone who owns contacts, but spends most of their life in glasses (because lazy) I think I would find this case super useful. Plus so cute too. 5. 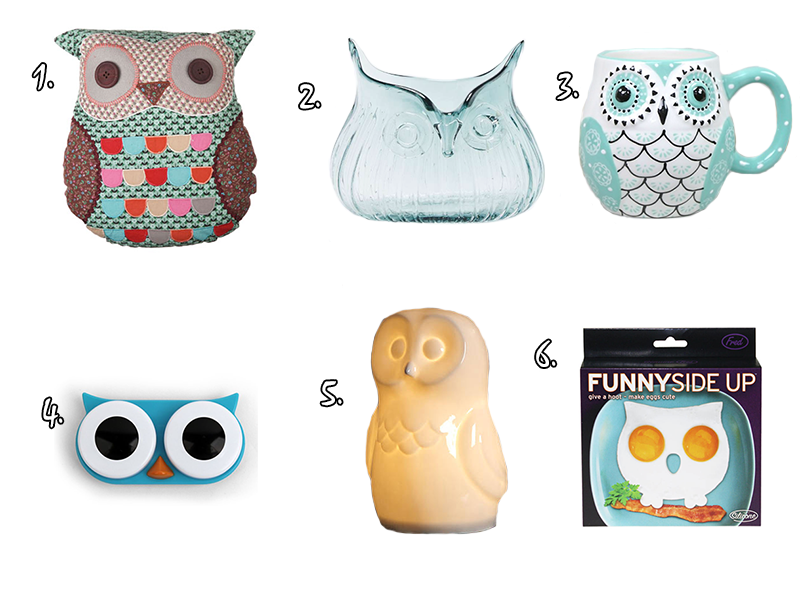 Owl Lamp £78.00 [x] : How adorable is this lamp? Aww. It would be so perfect in a Woodland themed kids room. Can someone make this happen? 6. Funny Side Up Egg Mould £7.95 [x] : If you're finding your morning breakfast a bit too boring, then shake it up with this adorable egg mould that will shape your eggs into an owl. Thank you for reading lovelies! How has your January been so far - did you manage to dodge the dreaded January blues? The owl mug is just the cutest! I have not worn contact lenses in a long time but I would start just to have an excuse to purchase the owl case. How cute is that? It would instantly put a smile on my face. the egg mould is so cute! I absolutely love that owl mug, it's so cute! Owls are so adorable. They're definitely my third choice, first elephants, second cats, third owls. Aren't they the cutest? I spotted the vase the other day and fell in love. You're definitely right, it wouldn't work for holding flowers but I reckon it could have other uses!